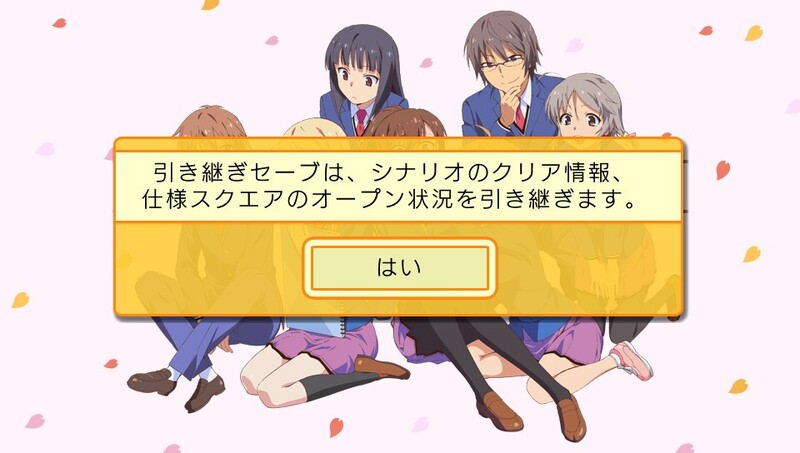 You start on the very first day, after Otoha Nakano has given you a description about the game design poster advertised. Choose "Game Specifications" for 2 days, until you can completed researching the design. 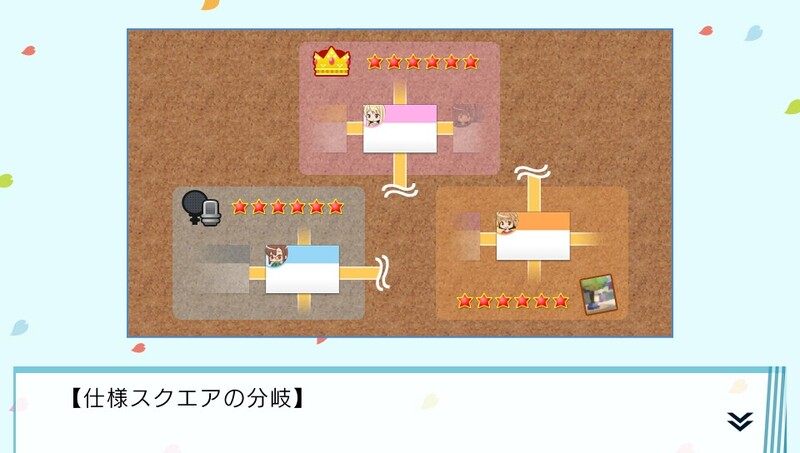 You DO NOT want to "overflow" the staff with lots of tasks, as this can lead to a serious problem if you are trying to achieve the 6 red stars, which is going to be explained soon. Why not alternate with some of the other staff members who are almost finished designing their own plans you researched for them? Shiina has started on her design work after you researched her. You do not want to overflow her with lots of 2D Design work she can do. You should focus on Jin, who is finished after turn 1 is up. 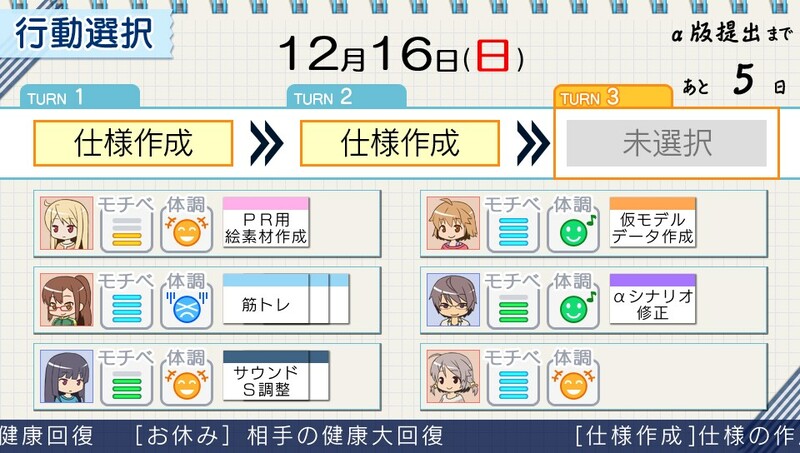 Akasaka is currently doing a design plan, but it takes him 1 full day (3 turns) to finish. It is recommended to give him another task the next time you can make a turn. The cycle will continue on and on until you notice or branch out a staff member and find that you can research tasks with "red stars" on the top. Are you getting the hang of the game right now? Now, let's focus on achieving these red stars that were mentioned earlier! What these red stars do is indicate that you are close to meeting the minimum requirements to advance on in the "Alpha" Stage. All what you need from this point on is to have everyone finish researching the red stars so you can proceed to the "Beta" Stage! Here's an example of these, "red stars" that you need to research and have your staff complete it! If you see one of the red star, and there's a Red stamp within the box, that means you have completed the minimum requirements for that certain character to work on! But, this guide will show an example if you didn't achieve all 6 red stars. 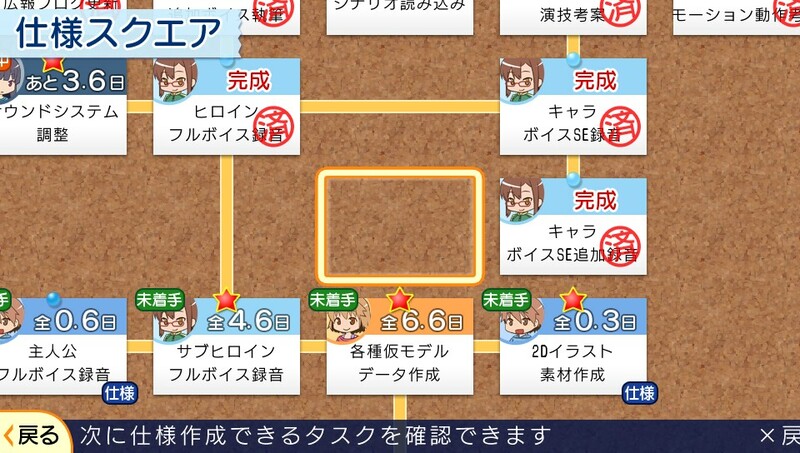 There's only 5 days left, but Aoyama has finish 3 other tasks before she can focus on the red star. "But, she has 4 bars of motivation. Should that at least speed up the process right?" Yes it can, but all 3 of the work she needs to do takes 5 days each, and by the time she starts on the red star task, its already 0 days. In addition, she is in a "sick" mood. This raises the chance of her becoming sick and not be able to work for 1-3 days. "What about the others? And if you say have like 3, or 4 or 5 red stars achieved?" Well the others.. Let me explain. This is 0 days until Alpha Planning must be finished. Aoyama, Misaki, and Shiina weren't able to finish their "Red Star" task. This means that half of the Alpha requirement weren't fulfilled by the deadline. 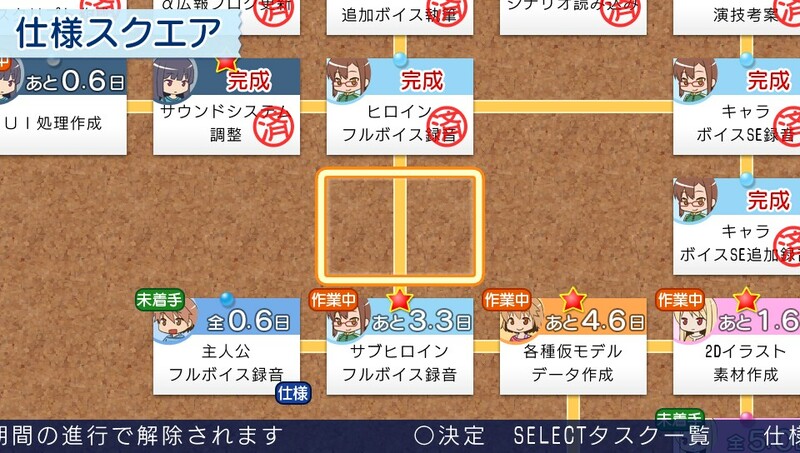 In short, you MUST have 6 red stars completed by the end of Alpha Planning to proceed on. This image is also an indication that it's Game Over. This notice also pops up too, which also says game over. So make sure you get all 6 red stars and have it completed by the Alpha Planning Deadline. 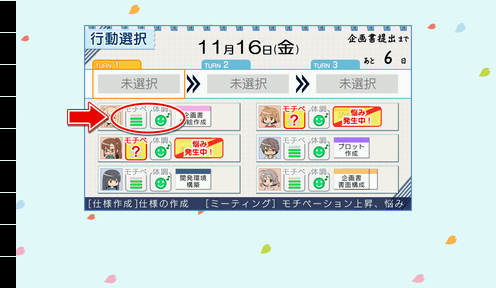 If you are on "0 days left until Alpha Planning Submission" and you get a scene that shows your Project Ranking, Congratulations! That means you have passed Alpha Planning! If you want to try completing the whole game without the Beta or Master Guide, be my guest! This is just a reference if you are confused or stuck on the game. Link to View the Beta Level guide!